ECU Joondalup’s Under-12s will compete with some of the best young players in the world after taking out the inaugural Volkswagen Junior Masters Australia in Sydney. 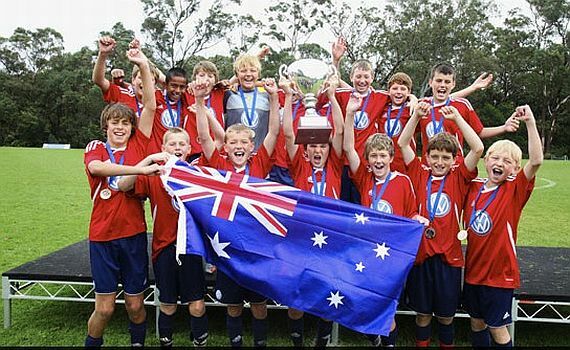 The Joondalup juniors completed last weekend’s two-day tournament with a perfect win record – amassing 23 goals while conceding just twice – to lift the trophy and book their place as Australia’s representative at the Junior World Masters in Warsaw, Poland, next May. 20 Under 12 teams from all the States and Territories participated in four leagues tournament, with winners progressing to the quarter finals, semi-finals and then the to the grand final. Playing in Group D, Joondalup got their campaign off to the flying start with big back-to-back wins over Flemington Eagles (5-0) and Loganholme (7-0) before seeing off a determined Leichhardt Saints (2-0). Top spot in Group D was secured with late Saturday afternoon’s 1-0 defeat of South Australian side Raiders. A comfortable victory over Shellharbour (5-1) put the team into the last four where they got the better of Brunswick City (2-0). In the final Adelaide City Juniors scored the opening goal only to see ECU Joondalup equalise in the second half. Both teams threw everything they had at each other but both sides found themselves perfectly matched, sending the game into extra time. Even with 10 minutes added to the clock neither team could gain the ascendancy and the first ever Junior Masters Australia was to be decided by penalty shootout. They will now go to the International tournament in Poland next May as a curtain raiser tournament for the European Championships. Teams from all the footballing continents of the world will attend, although ECU Joondalup SC will be the only Australian entrant. The opportunity to play against teams from Brazil, Argentina, Holland, Germany and Spain among others is a very daunting yet exciting prospect and we know the boys will represent their Club and Country with total commitment. ECU Joondalup’s Under-12 squad – and the Junior Masters Australia winners – features Mateo Bresciani, Bayley Brown-Montgomery, Ayden Dragun, Sam Fitzsimmons, Neil Gillies, Declan Hughes, Ashwin Jayakumar, Michael Kirkby, Nic Koefler, Ashley Maynard-Brewer, Joe Middleton, James Owen, Sam Pollard, Brent Quick, Luke Rhodes and Stefan Vranesevic.